Ophelia: A Botanist’s Guide, a limited edition chapbook by Zoo Cake Press, combines Emily Alta Hockaday’s sonnet sequence about Shakespeare’s Ophelia with Sam Hockaday’s illustrations of each sonnet’s key flower on the facing page. The chapbook collects and aggregates keys to Ophelia’s cipher—stage tradition, the language of flowers, a modern take on the Shakespearean sonnet, and botany, one of the oldest natural sciences. In “Pansies,” she says to Laertes, “But—I forget—this is for you, brother / your thoughts. Have mine, half-formed, / and do better with them. And these blooms.” Using Ophelia as speaker within a Shakespearean sonnet sequence makes the chapbook less an intervention in the original text and more an expansion of it. As an intertextual work, it’s a further extension of Hamlet, a poet at play within the raw stuff of Shakespeare’s play. but it takes choice, I guess. I take it back, you’ll need no help remembering. nightmares from following where you can’t. 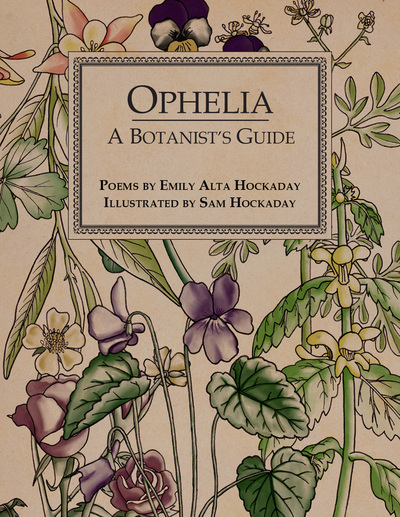 The chapbook’s appropriation of botany as guide seems especially relevant as Hockaday’s Ophelia seems engaged in the botanist’s work, using floral tropes to sort her life and relationships into that which sustains, that which heals, and that which kills. edible: I feel I have been eaten alive. In this way, Hockaday aligns poet and botantist. Ophelia may know nature, her own and her plants. Yet, no matter how much Ophelia may know about herself, those around her, or the botanical world, she has limited agency to enact that knowledge or control her own use. For Ophelia and her flowers, society ultimately validates and interprets action and meaning. This may be why Hockaday’s Ophelia ends in much the same place as Shakespeare’s, lamenting in “Violets,” “I told you: they have all withered / the day my father died,” suggesting this Ophelia is as bereft of fidelity and faithfulness in herself, her society, and her surroundings as her original. By linking botanical illustration with the language of flowers and stage tradition, Hockaday draws attention to an important divergence: an object’s nature and an object’s role. Hockaday’s juxtaposition suggests that navigating the gulf between something’s nature and the role it is given to play is the work of the botanist and the poet equally. Yet, Ophelia is like her flowers, both specimen and vehicle for meanings and use beyond her control. Even with all Hockaday’s play within the play, this Ophelia is as hemmed in by custom and tradition as ever. Letitia Montgomery-Rodgers’ work has been published in Gemini, The Missing Slate, The New Poet, Gulf Stream Literary Magazine, and The Burden of Light: Poems on Illness and Loss, edited by Tanya Chernov. A native of Pennsylvania, she currently resides in Buckingham, Virginia.